How To Prepare IPCC Exams During Study Leaves? How To Prepare For IPCC Exams During Study Leaves? Most of the individuals think that this information is only for aspiring students and it cannot be achieved. Read the entire article carefully, and we are sure anyone can easily achieve with his or her full concentration and focus ability. During the examinations of IPCC, various students get nervous because each paper consists of one day gap to prepare. Now, the big question is how a student can read or revise such a huge syllabus within a day as well as, get the highest score among which requires determination and strong will for succeeding. Here, we are discussing on how to prepare for CA IPCC within one day gap. Experts say “intelligence plays a significant role definitely, so the way you study can easily make or break your success at any examination.” Always study smartly that helps you a lot in terms of time-saving and instead of losing attempts in professional course examination due to studying hard not smartly. The primary purpose of saying that is, reduce the focus of unnecessary sections of your studies and start focusing on the important ones. 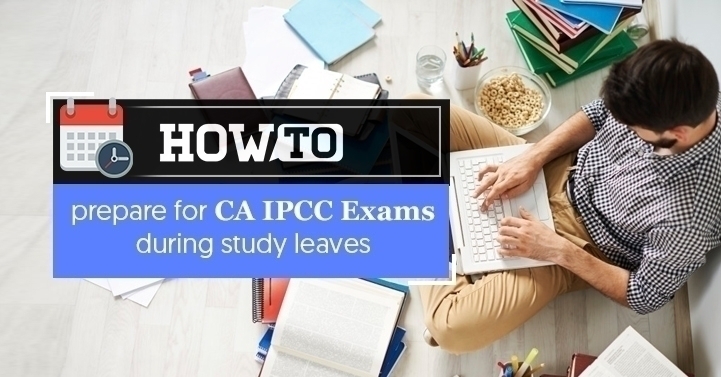 A special note to all CA IPCC students is that these tips will work only when you have taken classes of all subjects and have knowledge about it. The main reason behind that is, during the examination leaves, we can do only revision in the least possible time without reading additional topics. Begin with Accounts and Law subject from 4-5 days before, because it takes a long time to solve and understand the concepts. Therefore, during examination gap, you will not get panic and revise easily. Avoid Virtual World for few days of examination because it distracts the mind of students by its power. It does not mean that leave the web service, but it should be used for study not for Whatsapp, Facebook and so on. Keep your confidence level up along with the positive attitude. These two things work as a tonic for IPCC aspirants so they can easily fight with the tough questions and huge syllabus revision. It is not compulsory that if you are giving the IPCC exam and clear it in the first attempt. The reason is, the level of this professional course is very high, and most of the successful CAs got success after few failures. So, don’t lose your confidence at any cost. During the examinations, various students do not take rest and study continuously. As a result, their mind will get tired and, start feeling sleepy. In fact, students must take a short break and refresh the mind by taking a walk in fresh air or any activity that rejuvenates their entire brain. This technique is really helpful because the exam period is stressful, so no need to get panic. Before few months and days of the exam, complete the whole syllabus thoroughly and take a break from 2-3 days. Through this way, when you get a gap for an exam you can easily revise the syllabus by partitioning the chapters. In addition, there is no need to study extra topics in one day gap. It will diminish your entire studied syllabus and hard work. Only revise those things which you had studied. Another important aspect is, during the leave of exam start taking mock tests and checks the level of your preparation. This is the finest way of revision and to know your mistakes that you can overcome before the examination day. Various ICAI IPCC toppers say mock tests are helpful in one day gap for revising the entire syllabus within few hours. We hope this article helps those students who are preparing for final IPCC exams which are going on right now. Keep your mind calm and focused in examination hall on your mistakes which you did during the revision and mock tests. We assure you that determination, willpower and the ability to pass the examination will precede your life in the path of success.